My morning routine is very important to me, and my family. When I start late, start without a plan, or allow something to interrupt the first part of my day it rarely turns out well. I read a post by John Saddington today called “Protecting My Mornings“. In the post he explains why protecting his mornings it is so important, and I agree with him. I am most productive in the mornings. When I do not get a solid start I have an uphill climb instead of a downhill ride. This makes it harder for me to give all of myself to my family. I have noticed the beginning of the day is very important to my family as well. When we start late, or the kids wake up before us, or we have not prepared it can be rough, for all of us! A bad morning which leads to a rough day, could lead to a string of rough days, better known as a week! I have noticed there are a few things we do on the days when it starts right. They are helpful to my family, and can be used to develop a family morning routine for you. Wake up before the kids. When we wake up before our kids we can get ourselves together before tending to their needs. During this time before they wake up I can quiet uninterrupted time to pray, read my bible, think, and set the course of my day. If I allow myself to sleep, I wake up to a 3 or 7 year-old boy in my face asking for breakfast, milk, or taking him to the bathroom. There is a huge difference. Spend a few minutes with your spouse. I’m assuming if you are reading this you are grown. Therefore, you can think of one thing you can do together. That always makes for a good start! Or you can spend time praying together, going through a couples devotional, exercising or even talking while enjoying your morning drink. Eat breakfast together. In this fast paced world, it is not as common for families to sit down and have a meal together. The first meal of the day is the most important to your body, but there are also many more benefits to sitting around the table together. Plan what you will do. We’ve all heard the saying, “fail to plan, plan to fail.” This applies to families as well. Every family will have more things to do in a day then they have time to accomplish. However, some of those things are more important. Discussing and planning to do these things will get everyone on the same page, and it will instill this habit in your kids. Do something physical. You may not be able to do go to the gym with your entire family due to your work or school schedules, but 10-15 minutes of some light physical activity can be fun and good for you. My wife has this thing she does called, “Burn 100 in a 100” with the kids. It involves push-ups, sit-ups, squats, and jumping jacks. The kids love it. Leave each other with some encouraging words. Encouraging words have an amazing impact. As each family member goes about their way, say something encouraging to them. “Have a great day”, “You are amazing”, “I love you“, “You will do great!” Those words can stay with them all day. They’ll help in getting through challenges, and be a source of encouragement. When you are intentional about starting your day of right, and protecting your mornings individually and as a family, it gives you an opportunity to have a great day. My family can do better at doing all of the things above. I’m certain the more we do, as well as the more your family does we’ll have more fruitful and enjoyable days. String several of those days together and you’ll have more fruitful and enjoyable weeks. I encourage you to put into practice some, or all, of the things above with your family. 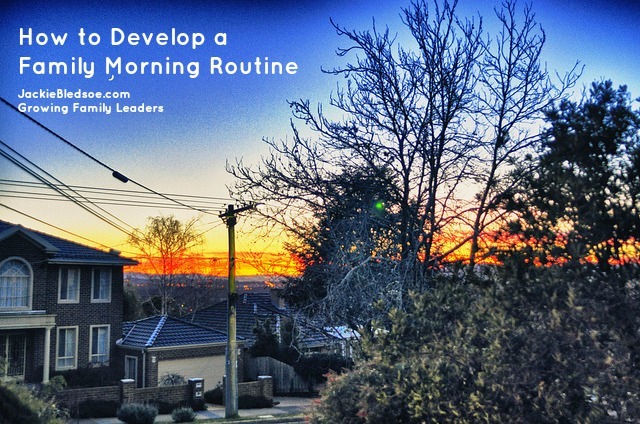 Question: How does your family start each day? Please share what works well and what has not in the comment section below.